From a park near Albuquerque, to the top of Japan's Mount Fuji, to the California coast the effect was dramatic: The moon nearly blotting out the sun creating a blazing "ring of fire." 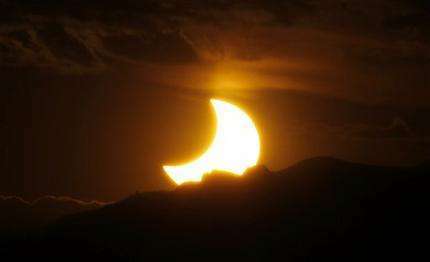 Millions across Asia and the Western U.S. turned their sights skyward for the weekend's annular eclipse, in which the moon passes in front of the sun leaving only a golden ring around its edges. The rare lunar-solar alignment was visible in Asia early Monday before it moved across the Pacific - and the international dateline - where it was seen in parts of the western United States late Sunday afternoon. People from Colorado, Oklahoma and as far away as Canada traveled to Albuquerque to enjoy one of the best vantage points at a park on the edge of the city. Members of the crowd smiled and cheered and children yelled with excitement as the moon crossed the sun and the blazing halo of light began to form. Some watched the eclipse by placing their viewing glasses on the front of their smartphones. Eventually, the moon centered and covered about 96 percent of the sun. "That's got to be the prettiest thing I've ever seen," said Brent Veltri of Salida, Colo. Elsewhere, viewing parties were held at observatories in Reno, Nev., and Oakland, Calif., while skywatchers gathered in coastal and forest counties in California. In some areas, special camera filters for taking photographs have been sold out for weeks in anticipation of the big event. 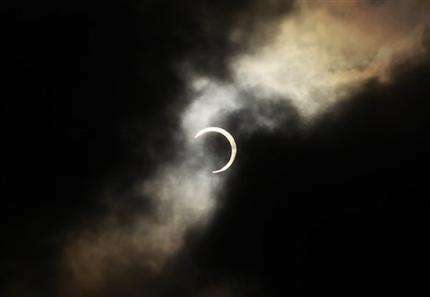 An annular solar eclipse seen from Tokyo, Japan, on May 21. Millions turned their eyes to the sky on both sides of the Pacific as a solar eclipse created a "ring of fire" from Asia to the western United States. Yet, while millions were making an effort to view the eclipse, some American Indians were adhering to tradition by staying indoors. Navajo Bonnie Charley of Monument Valley in northeast Arizona said she follows her tribe's traditions. "You're supposed to stay inside," said the 75-year-old Charley, whose father was a medicine man. "No eating, drinking or sleeping. That's for the duration of the eclipse." She said Navajo traditions surrounding eclipses stem from their beliefs regarding creation. The eclipse was broadcast live on TV in Tokyo, where such an eclipse hasn't been visible since 1839. Japanese TV crews watched from the top of Mount Fuji and even staked out a zoo south of Tokyo to capture the reaction of the chimpanzees - who didn't seem to notice. Eclipse tours were arranged in Japan at schools and parks, on pleasure boats and even private airplanes. Similar events were held in China and Taiwan as well, with skywatchers warned to protect their eyes. 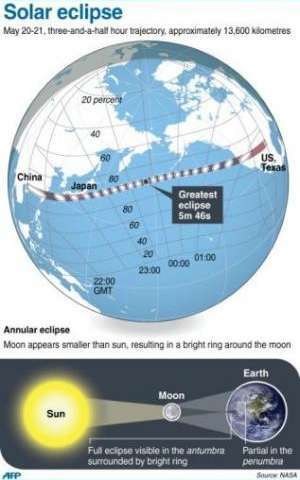 Graphic showing the path of a solar eclipse that traversed the northern Pacific on Monday. At the Taipei Astronomical Museum in Taiwan, the spectacle emerged from dark clouds for only about 30 seconds. But the view was nearly perfect against Manila's orange skies. "It's amazing. We do this for the awe (and) it has not disappointed. I am awed, literally floored," said astronomical hobbyist Garry Andreassen, whose long camera lenses were lined up with those of about 10 other gazers in a downtown Manila park. Hong Kong skywatchers weren't so lucky. Several hundred people gathered along the Kowloon waterfront on Hong Kong's famed Victoria Harbor, most of them students or commuters on their way to work. The eclipse was already underway as the sun began to rise, but heavy clouds obstructed the view. The eclipse followed a narrow 8,500-mile path for 3 1/2 hours. The ring phenomenon lasted about five minutes, depending on location. People outside the narrow band for prime viewing saw a partial eclipse. 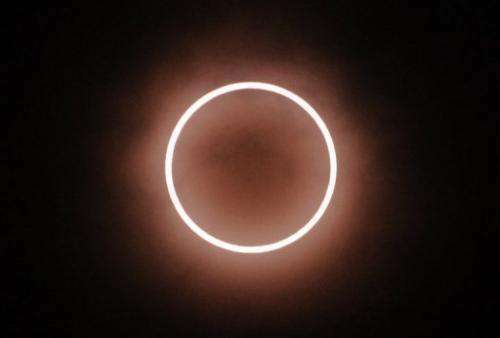 "Ring of Fire" eclipses are not as dramatic as a total eclipse, when the disc of the sun is entirely blocked by the moon. The moon is too far from Earth and appears too small in the sky to blot out the sun completely. Doctors and education officials have warned of eye injuries from improper viewing. Before the event started, Japan's Education Minister Hirofumi Hirano demonstrated how to use eclipse glasses in a televised news conference. Police also cautioned against traffic accidents - warning drivers to keep their eyes on the road. My wife and I are fortunate enough to live in an area where the eclipse passed. We enjoyed is as we went for an afternoon walk with the dog.